Top: Melbourne Street Jazz Club 1956, shortly before the band cut their first record at Northern Sound Studios. 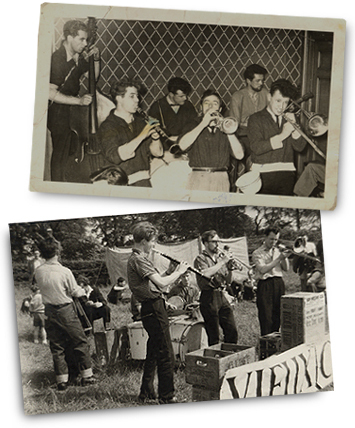 Left to right: Jed Ward on bass, Ronny Robinson on clarinet, Jimmy Stewart on drums, Peter ‘Gassy’ Gascoigne on trumpet, Peter ‘Big Pete’ Deuchar on banjo, and Pete Coles on trombone. Above: Chester-le-Street park circa 1957. Note the Robert Deuchar Ltd. and James Deuchar Ltd. Lochside Ales beer crates which were sometimes used to create a portable stage. Left to right: Johnny Handle on bass, Ronny Robinson, Jimmy Stewart, Gavin Baker on banjo, Gassy and Pete Coles. The year is 1954 and 22 year old James Peter Deuchar, grandson of brewery magnate and hotel owner James Deuchar, has come to a crossroads in his life and must decide which direction to take. Dark haired, over 6 feet tall and very good looking, ‘Big Pete’ Deuchar was a charismatic, striking individual. A former public schoolboy, he appeared to be the natural heir to the family business. After leaving school he attended agricultural college, was articled to a chartered accountant, served in the RAF during National Service and afterwards joined the family brewery business of James Deuchar Ltd, working in Wolverhampton and Edinburgh to learn about brewing and the licensed trade of hotels and public houses. However, brewing beer did not figure in his aspirations even though a comfortable and privileged future was assured. 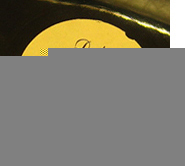 A talented banjo player and guitarist, enthusiastically devoted to the hand-clapping, foot-stomping, syncopated music of the American deep south, New Orleans jazz, to which he would listen on his Pye ‘Black Box’ record player and play along on his banjo at every opportunity. Big Pete’s burning ambition was to form a group of like-minded musicians, so, along with his good friend, trumpeter Peter Gascoigne, Jack Goodwin on trombone, John Saxelby on clarinet, John Lowes on bass and Pete Drysdale on drums, he launched his band and named it after a famous old neighbourhood in New Orleans, the Vieux Carré, better known as the French Quarter. The Vieux Carré Jazzmen had arrived in Newcastle...but their long journey was just beginning. Consequently Lucas’ recording of the Vieux Carré was flat and not as well balanced. Pete Coles was disappointed with the result but Deuchar was happy because it sounded different to the Panama’s. Was the record a success? Of the 100 copies ordered, the band got one copy each, Deuchar sold about 25 and the rest were given away as souvenirs. Vieux Carré banjo player Brian Bennett recalls: "I first saw the Vieux Carré Jazzmen in 1961 when I was a student at Sunderland College of Art. The gig, attended mainly by students from the nearby colleges, was held in the upstairs room of the popular George & Dragon Hotel. Above: Ronny and Bill in The New Orleans Jazz Club, wearing the famous red waistcoats......and today the waistcoat still fits the Bill! Below left to right: Demolition site, formerly Melbourne Street Jazz Club; period advertisement for VCJ; crowd gathers to watch musicians perform on top of the rubble; The Hawthorn Inn. "The band were terrific, but what also struck me immediately was their showmanship. Dressed in jeans, white shirts and bright red waistcoats (supplied by top gentlemen's outfitters, G.A. Dunn & Co. Ltd. of Oxford Street) they were the epitome of early 1960s cool. "Former Vieux Carré bass player, Bill Brooks, still has his original waistcoat and, when I borrowed it to photograph, I instinctively rifled through the pockets hoping to find some of the money he hadn't declared to HM Inspector of Taxes all those years ago (fat chance, Bill!). 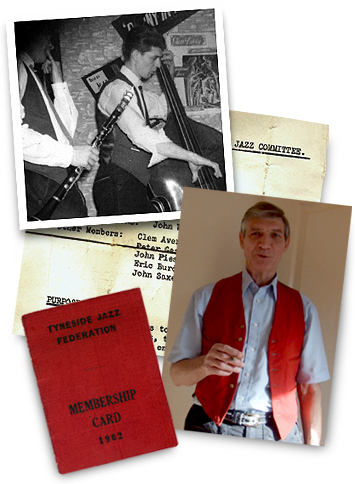 However, what I did find was Bill's 1962 membership card for the Tyneside Jazz Federation, a crumpled up piece of paper with the chords for 'My Gal Sal' in the key of C, and, most interestingly, a foolscap folio page [click here to view in new window] folded down to 'waistcoat pocket' size of the Newcastle Jazz Committee mission statement and rules."